More exciting news from the Asset Finance Solutions group. We have now been awarded investors in people (IIP) accreditation! Our Group Operations Director Justin Ford had this to say about the award “Experience, excellence and expertise are the principles we continually strive to achieve throughout the AFS group of companies. 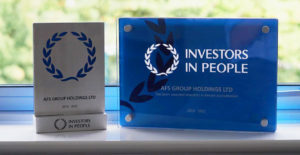 Our achievement of the Investors In People award strengthens this ethos and confirms the key to our success and growth is down to quality of people who work within the business. By investing in our people, they invest in us. I would like to congratulate everyone within the business on their success in achieving this accreditation”. IIP accreditation means we are constantly moving and constantly improving. IIP provide a framework to ensure our business continues to expand, aiding the personal and professional growth of representatives at all levels. This is done through clear benchmarking, route-planning and development milestones. We are able to develop better leaders at every level of the organisation. We are able to ensure that all people-managers are able to fully support their teams. We’re able to use the IIP framework to measure how effectively our staff are working. Not only will this highlight when they’re going above and beyond, it also ensures that we are able to easily recognise grounds for improvement. With the right structure brings comfort. IIP helps us to create and maintain the most effective business structure. This allows us to future-proof our business and ensure sustainable success. Our IIP accreditation will help us embrace change. This allows us to exponentially improve with a clear road map for success. As part of our support package from the IIP, we will have access to a dedicated, highly experienced business management practitioner. We will have full access to datasets surrounding our business. This means we’re able to compare our own statistics with our industry peers and secure boardroom buy-ins by bringing data to the table. We’re extremely excited to have the support of Investors in People. Their hard work combined with our industry-leading services should ensure that AFS retains its level of excellency well into the future.